the perfect compromise for those with gluten-sensitivity. recommended for those who are gluten-sensitive. • Gluten-free products are not just a passing fad: there are genuine health advantages to avoiding gluten in the diet. Almost 15% of the population may be sensitive to this substance which unfortunately seems to be in everything. Widely used in packaged foods, it is very difficult to avoid it completely which is why SuperSmart has come up with a formulation to aid the digestion of gluten and prevent the digestive discomfort associated with its consumption. A remarkable solution to the problems caused by eating gluten-rich foods. What is gluten and how is it digested? • Gluten is a water-insoluble protein formed when gliadin and glutenin - two peptide components of flour from wheat, rye and barley - are mixed with water. Its sticky and elastic properties are very useful in making bread, pasta and pastry, helping them to keep their shape. What are the problems associated with gluten? • Gliadin and glutenin are poorly digested, indeed some people cannot digest them at all. These undigested gluten proteins trigger the immune system to attack intestinal villi (small folds in the mucosa) which prevents these peptides from being absorbed correctly and results in serious problems in the gut as well as potential malnutrition. This is what is known as coeliac disease (or gluten intolerance). • However, another form of gluten intolerance has come to the fore in recent years: non-coeliac gluten sensitivity. As its name suggests, this has little to do with coeliac disease, displaying neither specific antibodies to the disease nor waste products in intestinal mucosa. Yet gluten consumption causes the same types of symptoms: abdominal pain, bloating, intestinal disorders, diarrhoea and constipation, as well as headaches, fatigue, joint and muscle pains, numbness in limbs, skin problems, depression, and anaemia … These symptoms generally come on after consumption of foods that contain gluten and disappear when they are eliminated, only to reappear when these foods are reintroduced. Around 13% of Western populations may be affected by this hypersensitivity – on top of those who are allergic to gluten. How can you reduce gluten sensitivity? • For those with coeliac disease, the only treatment is to meticulously avoid foods that contain gluten. However for people who are sensitive to gluten, it is possible to break down gluten proteins and thus reduce sensitivity and its associated problems. • The only enzymes that can degrade these proteins are those able to break down prolyl-enriched peptides: the main reason for gluten sensitivity is the proline-rich peptides in gluten. 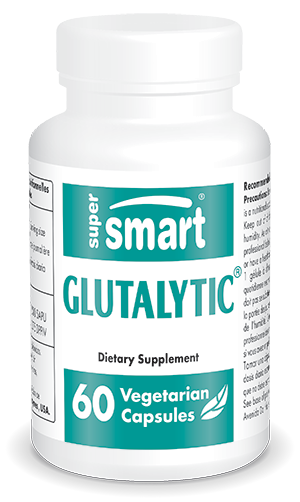 SuperSmart has thus developed a formulation called Glutalytic® which consists of endopeptidases and exopeptidases, functional enzymes that are able to fully break down gluten proteins. • Randomised, double-blind, placebo-controlled clinical trials showed that when gluten-sensitive subjects took Glutalytic® alongside consumption of gluten-containing foods, there was a significant and rapid improvement in the majority of their digestive problems. The support it offers is superior to all other such products currently on the market which only contain dipeptidyl peptidase=4 (DDP 4), an enzyme which does not break down all the large peptides in gluten. How should Glutalytic® be taken? • How much Glutalytic® to take depends on the amount of gluten consumed in a meal. For example, if you eat a large portion of pizza, the appropriate dose wold be two capsules, whereas a half-portion of that same pizza would only require one capsule. Since Glutalytic® only promotes the digestion of gluten proteins, there is no point in taking it in a preventive capacity, in between meals. To generally improve the digestion and absorption of all food groups, it is preferable to supplement with the formulations Digestive Enzymes or Pancreatin. • In summary, taking one to two capsules of Glutalytic® would seem to be the perfect way of ensuring optimal digestive comfort when eating a gluten-rich meal. It is strongly recommended for anyone sensitive to gluten and for those who experience repeated digestion-related symptoms following consumption of gluten-containing foods. Adults. Take one capsule with each meal.